Los Angeles (July 20, 2012) – Viking River Cruises (www.vikingrivercruises.com) today announced it has placed an order for two additional Viking Longships in 2013. This brings the number of new ships launching next year to eight – an industry first – and a total of 14 new Viking Longships over a two year period. · Two Explorer Suites, the largest river cruise suites in Europe at 445 square feet, each featuring a separate living room, bedroom and private wraparound veranda, offering 270-degree views. · Seven two-room Veranda Suites with a full-size veranda in the living room and a French balcony in the bedroom. · Thirty-nine Veranda Staterooms with full-size verandas. · Twenty-two French Balcony Staterooms. · A revolutionary new all-weather indoor/outdoor Aquavit Terrace, which reinvents the onboard lounge experience by bringing the panoramic outdoor river scenery indoors with retractable floor-to-ceiling glass doors allowing guests to enjoy the scenery and dine al fresco. · New premium in-cabin amenities that include heated bathroom floors and mirrors, Sony HD TV’s and premium bath products. Accommodating 190 passengers, the ships are scheduled to sail four of Viking’s most popular European itineraries, including the 10-day Tulips & Windmills, 8-day Romantic Danube, 15-day Grand European Tour and 8-day Danube Waltz. The two newest ships, Viking Jarl and Viking Atla, will host guests on the 8-day Rhine Getaway cruise sailing from Amsterdam to Basel. Each of the new Viking Longships will be 443 feet (135 meters) long and will feature 95 staterooms per ship. *Corridor configuration registered designs patent pending numbers 1832106-0001 to 1832106-0011. Ship’s front bow registered design patent pending, number 1205004.3. Viking River Cruises, the world’s leading river cruise company, offers scenic cruising along the rivers of Europe, Russia, Ukraine, China, Southeast Asia and Egypt. The company was named No. 1 River Cruise Line in Travel + Leisure’s 2012 “World’s Best” Awards and has been honored multiple times as the top river cruise line on Condé Nast Traveler’s “Gold List” It has also been recognized as the World’s Leading River Cruise Operator at the World Travel Awards and by the editors of Cruise Critic as “Best River Cruise Line” in the website’s 4th Annual Editors’ Picks Awards. Travel agents have recognized Viking River Cruises as “Best River Cruise Line” by Travel Weekly, “Best River Cruise Line” by Recommend and Travel Agent magazines, Best Cruise Line for Luxury River Cruises at the Luxury Travel Advisor Awards of Excellence and as “Best Overall Cruise Line for River Cruising” and “Best River Cruise Line for Travel Agent Support” by TravelAge West. Since its 1997 inception, the company has grown to a fleet of 33 vessels (in 2013), and provides unique, deluxe vacations to experienced travelers with an interest in geography, culture and history. For additional information, contact Viking River Cruises at 1-877-668-4546 (1-877-66VIKING) toll-free or visit the company online at http://www.vikingrivercruises.com. 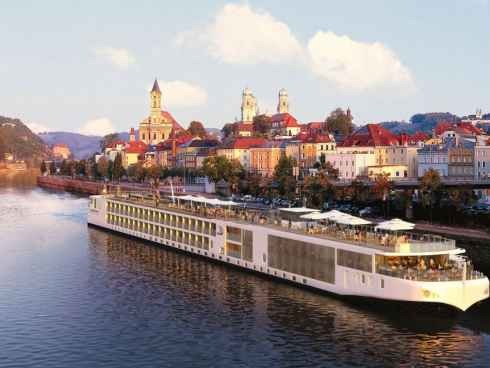 To join the Viking River Cruises community online, visit http://www.facebook.com/vikingrivercruises.